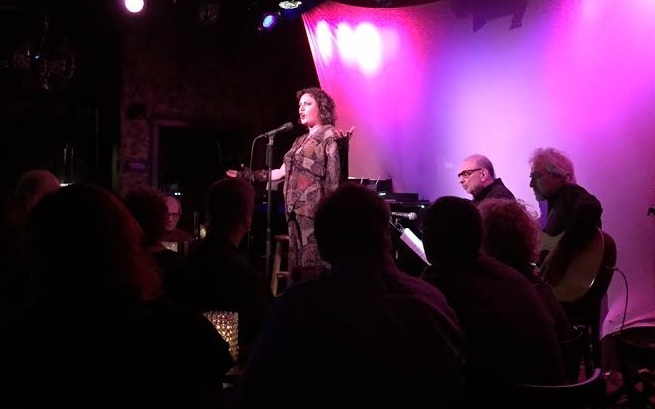 Karyn Levitt offers a cabaret tribute to Hanns Eisler. Karyn Levitt (center) in concert at the Metropolitan Room. The name of Hanns Eisler is shrouded, both by the mists of time and the fact that he is one of the few composers to have his work banned by the Third Reich. Ten years later, he was booted out of the United States, thanks to the anti-Communist witch hunts of the House Un-American Activities Committee. New York soprano Karyn Levitt is out to correct those injustices and place Eisler back in the orbit of important 20 century composers. Her CD, Eric Bentley's Brecht-Eisler Song Book was the first step, but a more important one is to get the music of Eisler in front of a live audience. On Saturday afternoon, Ms. Levitt offered a program, Will There Still Be Singing? at the Metropolitan Room, a luxe cabaret space on W. 22nd St. Accompanied by the Hanns Eisler Trio (music director/pianist Eric Ostling, accordionist William Schimmel and guitarist Ira Siegel) she gave an 18-song retrospective of Eislers career, arranged chronologically and salted with some delicious detailed narrative about the composer's chaotic and remarkable life. The concert opened with Ms. Levitt strolling through the audience singing "Will There Still Be Singing?" before the trio swung into the proper set opener "And What Did She Get?" The sardonic lyrics were penned by Berthold Brecht, offering bitter and sweet comments on the vagaries of traveling Europe in the era before the Great Depression. Ms. Levitt explained how Eisler was Brecht’s favorite collaborator, even though that German playwright is better remembered for his work with Kurt Weill, before singing Brecht’s "The Love Market." Eisler was a pupil of Arnold Schoenberg, and that composer’s twelve-tone technique can be heard in the jazzy "Printemps Allemand." The political voice of this artist emerged next in a triptych of protest songs. The last, the harrowing "Truly I Live in a Time of Darkness" spoke of the encroaching Nazi eat before Ms. Leaving chronicled Eisler’s flight from tyranny, a multi-country odyssey that ended with him joining his teacher Schoenberg in sunny Southern California. Eisler’s American pastorale lasted until 1948, when he became the first major Hollywood artist to land on the infamous HUAC blacklist. This period was reflected in a set of four Brecht collaborations, of which the most famous is "To The Little Radio,"a lied celebrating the technology of the times. If that melody is familiar it’s because you heard it in the 1980s. Rock singer Sting borrowed it for "The Secret Marriage", the last track on his 1987 album ...Nothing Like the Sun. The sad story of Eisler's exile and return to a Germany falling behind the shutter-door of the Iron Curtain was chronicled by Mr. Ostling, who offered an extended piano improvisation on Komi tern, the Party anthem written by Eisler. Ms. Levitt returned to sing "The Homecoming" and the nostalgic "The Poplar Tree on Karlsplatz." She then sang "Auferstanden aus Ruinen" the national anthem of the late state of East Germany to jingoistic words by Johannes Becher. After this bit of nostalgic propaganda, Ms. Levitt ended her set with two more thefts from Eislers favorite collaborator Berthold Brecht. These were the grim"A Saying for 1939" amd the powerful "You I'll Be Borne Up," an surprising anthem of optimism given the grim content of this show. She concluded with a reprise of the raucous "And What Did She Get," making a grand exit as the audience clapped willingly along. In this little room at least, Hanns Eislers reputation had been saved.